12) BUSINESS GROWTH HACK: ABSORB YOUR CLIENTS’ STRESS! and a 100% conventional with no mortg No portion of this issue may be reproduced in any manner whatsoever without prior loans, consent of the publisher. 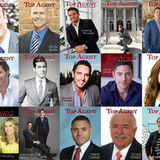 Top Agent loan Magazine Currently, a staggering ninety percent of Nate’s visit ContourMortgage.com/Jason-Shannon, or call (516) 425 – 4518 insurance. Chuck, as a veteran, is particularly prou is published by Feature Publications GA,onInc. Although precautions are taken to ensure the accuracy of published materials, business is based repeat customers, and past-client the many VA loans he has done. “We do a lot of tho Top Agent Magazine cannot be held responsible for opinions expressed or facts supplied by its authors. 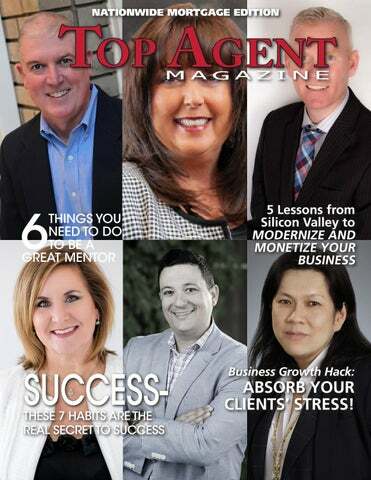 To subscribe or change referrals of friends and family and is perhaps the most address, send inquiry accurate to mag@topagentmagazine.com. Published in the U.S. he says. “When veterans talk to other veterans, we t measure of the excellent customer service Copyright Top Agent Magazine they provide. Excellent communication is one of the to trust each other because we’ve been through so m strongest reasons for this amazing customer loyalty, of the same things and there is an instant connectio Top Agent Magazine and Nate and his team strive to keep every one of their For more information about Nate Pina, buyers and Realtor partners constantly up to date on please call 707-718-6060 or is referral base The entirety of Chuck’s business www. There are many other reasons for Lilly’s success, among them her welcoming demeanor and her constant striving to keep her buyers and Realtor partners informed every step of the often-convoluted loan process. “I’ve noticed there are times when I’ve tried to get ahold of my own lender, and I had to leave a voicemail and wait twenty-four hours for a return call,” says Lilly. “I make sure I pick up the phone when someone calls me, and I don’t mind if they call me on the weekends or at night.” Lilly’s own poor experiences working with lenders factors into her commitment to providing exceptional customer service, and making sure all of her buyers are completely educated about what to expect when obtaining a loan. “I always make sure my clients understand what the differences are between the loan products that are available for them,” she explains. Lilly is also proud of the wide variety of loan products PNC offers. Anyone looking for a mortgage would do well to read Lilly’s reviews on Zillow.com, on which site she holds a perfect-five star rating. Among the glowing testimonials she has received is this one: “In the process of buying our first home, Lilly’s performance was outstanding. She was incredibly patient and took the time to educate us and was able to move extremely quickly and was always super-responsive throughout the entire process.” In other words, if you’re looking for an exceptional lender, look no further than Lilly Chiang. To find out more about Dee Ann Harper, visit DeeAnnHarper.com, www. tablet, and there are ample audiobook subscription services out there that make regular listenership cost effective. Create a mental to-do list to get a head-start on your day, or to prepare for tomorrow Getting your thoughts in order with a straightforward to-do list can help you dive in once you make it to your desk, or serve as a conclusive mental routine to end your work day. If you drive to and from work and don’t have your hands free, don’t fret. Speaking your to-do list aloud can help you detangle your thoughts and tasks by vocalizing them. You can also try breaking down your to-do list by verbalizing the day’s goals, the week’s goals, and the month’s goals as a way of structuring priorities. If your commute is hands-free, you can incorporate a variety of apps that serve as custom-made todo lists that’ll organizationally map your duties for the day. In either case, use your commute window to identify and name the tasks ahead of you, and you’ll be able to hit the ground running when the time comes to perform. Tend to your personal commitments and planning A productive commute can boost your professional performance, but it can also serve your personal growth and out-of-the-office responsibilities, as well. Perhaps you can think out and plan your meals for the week so that you don’t come home burnt out and with nothing in mind for dinner. Maybe you check in with a relative or partner and catch up for a spare twenty minutes. Not only does this eliminate a few items off of your personal to-do list, it can actually give you a more focused mind at the office. If your personal life is in good order, you’ll be able to devote your full attention to work tasks. As the old saying goes, there are only so many hours in a day. If you added up all the minutes spent commuting around town, how many hours would amount? Though the trek to and from the office is an engrained part of professional life, it doesn’t have to be a drag. Account for those spare commute windows in productive ways, and in only a month you’ll have devoted a significant portion of your time to bettering yourself as a person and a professional. To learn more about Jason Shannon, email JShannon@ContourMtg.com, visit ContourMortgage.com/Jason-Shannon, or call (516) 425 – 4518 www. Valley seems like a world unto its own, there are key lessons prime for adaption in your own endeavors. Below, consider a few ways to translate the trends and teachings of Silicon Valley for your own business, and reap the rewards in the process. 1. Diversify your value Real estate is a business built on relationships, but your relationships will go stale if the only thing you communicate is you interest in making a sale. In order to sustain relationships for the long term, you’ve got to remain valuable to your clients beyond the transaction. Serve as a local resource, not just a salesperson or real estate expert. Ensure your marketing materials, social media presence, and communications offer useful, relevant, and original content your clients will benefit from. What’s more, vary your communications so that every time you reach out it’s not just about new business or a referral. 2. Company culture matters Silicon Valley tech giants always emphasize the importance of company culture—not just as a way of drawing and retaining talent, but also as a way to appeal to clientele. What are your company’s values? What do you stand for? How you’re positioned in the marketplace is becoming just as important as what you do and how well you do it. Your company culture is part of your branding, and your brand should feel clear and composed to clients eyeing your services. transportation stack up in the area? Before making the purchase of a lifetime, clients want to envision a complete lifestyle. 4. Leverage multiple platforms By now, you probably recognize that social media is not afterthought. Your social media presence should fit your brand and voice, interact across platforms, and actively engage with your audience. In other words, if you want to reap the benefits of social media, it’s not enough to post a few times a month and walk away. Active engagement means responding to comments, interacting with your followers’ profiles, and posting original content beyond a sales pitch. Likewise, you’ll want to be active across multiple social media platforms and ensure that your profiles are interconnected. That way, you’ll be working from a unified voice and brand. 5. Reputations rule the roost Never underestimate the power of word-ofmouth marketing and testimonials. If you haven’t asked for feedback from past clients, and you aren’t sharing positive testimonials and reviews—you’re missing out on one of the most powerful tools at an agent’s disposal. You can pitch the virtues of your working style all day long, but those courting your business want to hear about positive experiences from the client’s perspective. If you want to take your business to the next level and maximize the twenty-first century values of a company on the rise, look to the lessons of Silicon Valley to get your start. There are always opportunities to innovate, and doing so will help you break from your routine and stand apart from the pack. going on with the loan, and give them frequent updates, which makes everyone’s life a lot easier. “Also, we do not view the closing date on the sales contract as a suggestion. We take the responsibility of closing on time very seriously.” Chuck and his team also take a decidedly egalitarian approach with their business. “Our team mantra is that every deal is a big deal,” he explains, “regardless of whether someone is buying a $50,000 home or a million-dollar house. We treat all of our customers with respect, and we try to make the entire process as drama-free as possible.” Chuck is also passionate about giving back, and does so through a variety of endeavors. Recently elected the very first President of his local Veteran’s Association of Real Estate Professionals, Chuck is working with that organization to educate both veterans and real estate professionals about how veterans can use their benefits to purchase a home. Chuck’s primary plans for the future include growing his business and adding team members who share his client-first ethos. “I want to make sure we’re growing intelligently, and not just for the sake of growing,” he says.